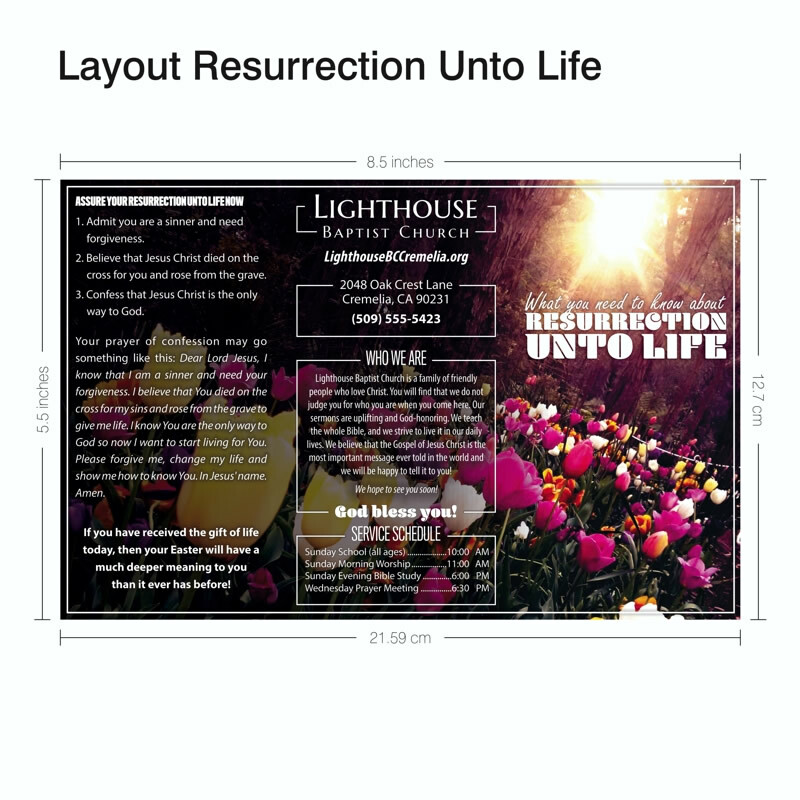 If you would like to submit your own custom design to be printed on our tracts, your artwork should measure 8.625 x 5.625 inches. The final cut size will be 8.5 x 5.5 inches, then folded to 2.833 x 5.5 inches. Your art should be created and exported at 300 DPI resolution in CMYK color. Important text or images that you do not want cut off should be located at least 0.2 inches away from the cut lines. If you are submitting exported images, please submit one image each of the front and back. You may either submit your files by clicking the "Upload File" button when setting up your order, or email your files to sales@kjv.com. Creating your own print-ready design? Both sides of the 8.5 x 5.5 inch surface may be printed upon. Any background color or images that you wish to have printed all the way to the edge should extend 0.0625 inches beyond the 8.5 x 5.5 inches for a total bleed-sized art piece measuring 8.625 x 5.625 inches (8.5 x 5.5 inches + 0.0625 inches extra on all sides). We recommend that most text be sized at least 10 points for best readability. While setting up your design, keep in mind that there will be 2 folds (located at approximately 2.875 inches and 5.725 inches measured from the left edge of the inside of the tract, and from the right edge on the outside of the tract). Customizing one of our designs? A couple more lines of church information, service times, ministries, or other information. A slightly larger logo, map, or other graphical element. A slightly longer version of the plan of salvation or the church introduction. Edits are limited by available space. Most templates already contain close to the maximum amount of information possible before text cannot be comfortably read. Considering this, we suggest that you do not add much more information to a template. It is best to start by changing existing elements before trying to add new ones. If you need even more info included but feel you may be running out of space, try looking at the design and decide if there are elements that you could do without. Little changes, such as removing a dividing line, can often free a bit of space. Choose tract, we customize, you approve, we print. Get the Gospel Out into YOUR Community this Easter! 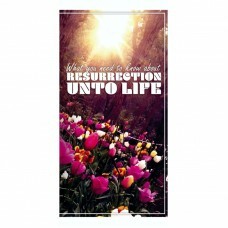 "Resurrection Unto Life" gospel tract explains what Easter is truly about; the death, burial, and resurrection of Jesus Christ. It explains that just like Jesus we will all die, be buried, and resurrected, but the resurrection of some will be unto damnation. Let people know that their resurrection does not have to be unto damnation, for Jesus has provided a way for them to be resurrected unto life. Bring people to the saving grace of Jesus Christ this Easter! Our custom tracts are printed on heavy 100# Gloss Book stock and coated with a scuff-resistant AQ Gloss coating, so they can endure a lot of handling with minimal tattering. No paper is totally moisture-resistant, but these tracts will not be slowed down by a little rain. The ink will not bleed or run, and the paper will not readily absorb the moisture—just shake off the droplets and carry on! Carry them in your pocket, purse, or wallet. Keep a stack in your glove box. Hand them out while tracting, keep your tract rack well-stocked, and include them in your Welcome Packet. Not only do these tracts get out the gospel, but they can double as a mini-brochure for your church. Full-color printing indicates to the recipient that your message is more important than running off flyers on an office copier. The heavy paper stock, full color imprint, and glossy finish is eye-catching and has a professional feel. We can change as little or as much of the layout as you want. Want a different color scheme? Done! A different background image? Done! Change to an alternate presentation of the gospel? Done! We can even set up a map as an add-on to the order. These tri-fold tracts measure 8.5 x 5.5 inches flat, so there are six panels measuring roughly 2.833 x 5.5 inches each—you'll be surprised how much information you can fit in that space! We are sure you'll find that these versatile tracts provide an easy and reliable way for your church to spread the gospel to your community and introduce them to your church at the same time. 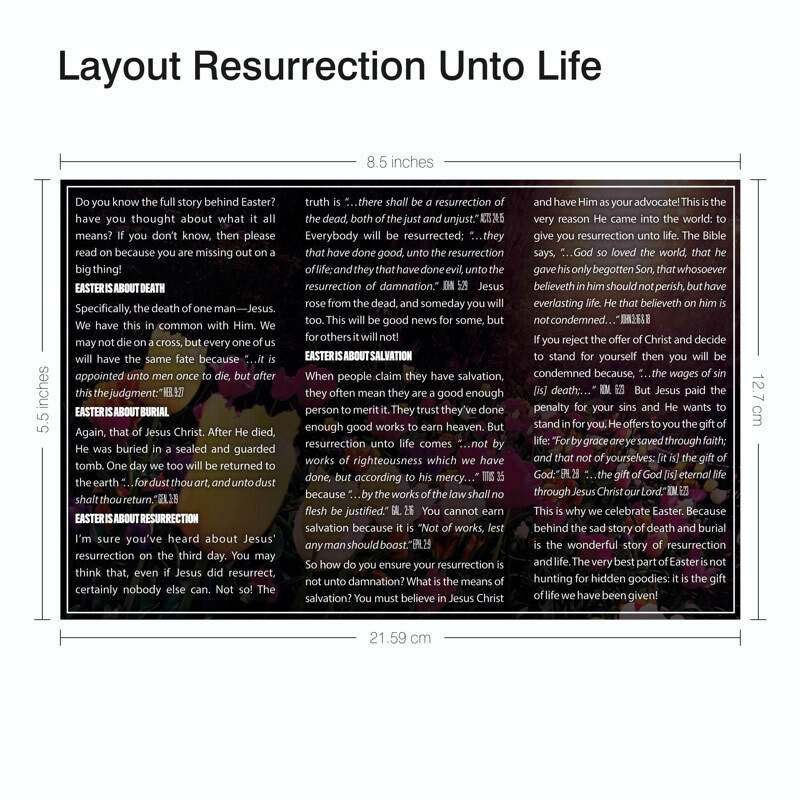 Isaiah 55:11 "So shall my word be that goeth forth out of my mouth: it shall not return unto me void,..."
Have you ordered this layout before? Yes, print the same thing you printed last time. Yes, print the same thing you printed last time WITH CHANGES (as described below). What do you want changed on the tract? We will email you with personalized tract for approval before we print. What Happens When You Order?Get the Gospel Out into YOUR Community! Our 8.5" x 5.5" tracts are co..
Get the Gospel Out into YOUR Community this Easter!Easily deliver the gospel to every door this ..
Get the Gospel Out into YOUR Community this Easter!Easily deliver the Gospel to every door this East.. Invite YOUR Community to church this Easter! Postcards are the perfect Easter outreach to..